Hey yall! I hope that your Monday has been great, because I know it can be tough. By the way, can you ever have too much coffee on Mondays? Because it's late in the afternoon and I have had 3 cups, and may still need a few more. If you haven't already caught it up on my previous posts make sure you do. Last week I was nominated for my first blogging award so make sure to check out my responses. Also, there was a Texas Music Thursday post, hopefully you find a new band that you like, and if you dont, it okay. Lastly, I was finally able to about my weekend in Houston! Check out the pictures. Okay, now that I have put you up to date on last week (and hopefully you have also read the posts) it is time for this weeks playlist! As you may already know September is the month for Childhood Cancer Awareness. The color to represent this is Gold. 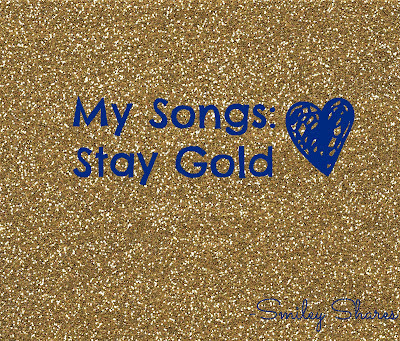 Which is why my playlist includes songs with the word Gold or Golden in them. I will admit it was interesting finding the songs. Since I am more of a lyrics person I had never really paid attention to the titles. So here we go. Okay, so I get it. The songs may seem a bit all over the place, but yall already know my taste in music, is all over the place. Also, I understand that some of the songs may have never made it to your playlist. However that is part of the beauty in being able to share new music with others. Enjoy it and in the words of Johnny Cade "Stay Gold, Ponyboy". Labels: Gold , What am I listening to? I haven't listened to Fall Out Boy in so long! Thanks for sharing! This is a perfect playlist!